What is Self assessment tax under section 140A? On the basis of the incomes earned throughout the year, a taxpayer files his return. After calculating the total tax liability and considering all the taxes paid in advance, if a shortfall arises in the tax payment, it is covered up with the payment of self assessment tax before the filing of return. In other terms, Self Assessment Tax under section 140A is the tax paid at the time of final assessment of the income by the taxpayer earned during the year. When Self Assessment Tax is paid? Taxpayer needs to pay Self Assessment Tax before filing of his Income Tax Return but after taking credit of all the taxes paid in advance or relief(s) under various sections. How to pay Self Assessment Tax? You will have to mention the details of self assessment tax paid such as Challan no., date of payment, etc. in your Income Tax Return. How is Self Assessment Tax calculated? 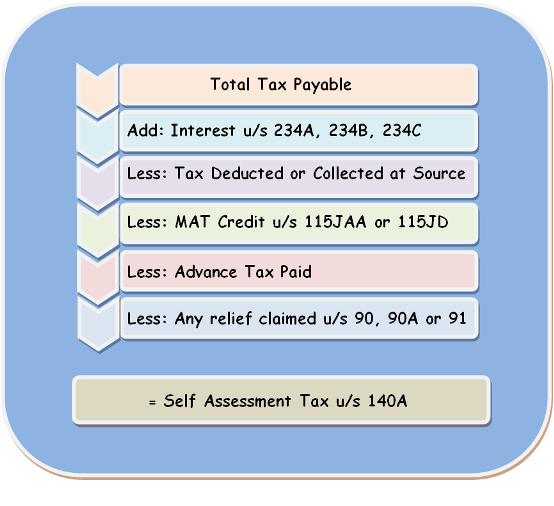 How the self assessment tax paid is to be adjusted with the interest under section 234A / 234B / 234C? Where the self assessment tax paid by an assessee falls short of the actual i.e. the taxpayer does not pay the amount in full then the amount so paid by him shall first get adjusted towards the interest payable and the balance towards the tax. Let's understand this with the following example. Now, as Miss Poonam did not pay self assessment tax in full therefore, the amount paid will first be adjusted towards interest under section 234A / 234B / 234C and the balance towards tax as below. Please note that Interest under section 234A is levied for late filing of Income Tax Return while the Interest under section 234B / 234C is levied for delay in payment of advance tax. What if you don't pay self assessment tax in full? Return cannot be filed until and unless the total tax liability of the assessee has been paid by him. Therefore, you will not be able to file your Income Tax Return where you have not paid the taxes in full. There is a high probability of late return filing where you do not deposit self assessment tax in full. In such cases, you will be liable for Interest u/s 234A for delay in the filing of Income Tax Return. MyTaxCafe.com helps you to eFile Income Tax Return Online for free. Start eFiling now!